Some reports from Q2 2011. Highlights: According to the latest research from Strategy Analytics, global smartphone shipments grew an impressive 76 percent annually to reach a record 110 million units in the second quarter of 2011. Both Apple and Samsung overtook long-time volume leader Nokia for the top two spots in our rankings. Highlights: According to June data from Nielsen, Google’s Android operating system (OS) now claims the largest share of the U.S. consumer smartphone market with 39 percent. 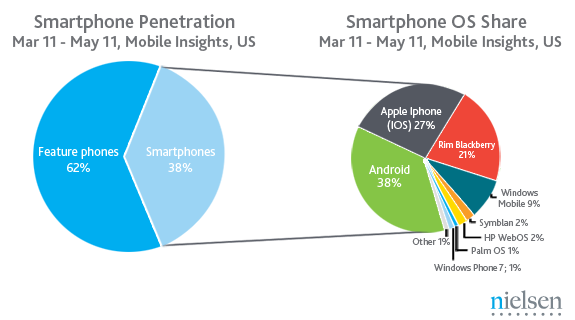 Apple’s iOS is in second place with 28 percent, while RIM Blackberry is down to 20 percent. Highlights: The story remains largely unchanged from last quarter: Three companies which captured 11% of the profits before the modern smartphone era started (four years ago!) now capture 84% of the profits. Only one global brand phone vendor selling non-smart voice-oriented feature phones is still profitable however, as we shall see later, the only reason profits still exist for any vendor is due to the strength of their smartphone portfolio. Highlights: ZTE Became Fifth-Largest Mobile Phone Manufacturer and RIM Dropped to No. 6to Gartner, Inc. (see Table 1). Sales of smartphones were up 74 percent year-on-year and accounted for 25 percent of overall sales in the second quarter of 2011, up from 17 percent in the second quarter of 2010.“Smartphone sales continued to rise at the expense of feature phones,” said Roberta Cozza, principal research analyst at Gartner. Google and Apple are the obvious winners in the smartphone ecosystem. The combined share of iOS and Android in the smartphone operating system (OS) market doubled to nearly 62 percent in the second quarter of 2011, up from just over 31 percent in the corresponding period of 2010 (see Table 2). Gartner analysts observed that these two OSs have the usability that consumers enjoy, the apps that consumers feel they need, and increasingly a portfolio of services delivered by the platform owner as well. 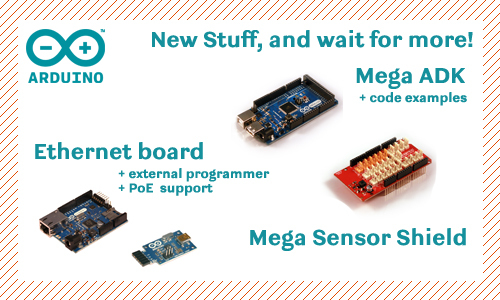 Arduino has just released the Arduino Mega ADK board. This is very interesting for several reasons. Google has recently released the Android Open Accessory Development Kit on the Arduino reference architecture. The Android Open Accessory development kit allows external USB hardware (an Android USB accessory) to interact with an Android-powered device in a special “accessory” mode. Basically this opens the door to the creation of a wide range of accessories from anybody. And the development is accessible to many, as the Arduino ADK board alone costs €59 ($83) and a wide range of sensors and extensions can be plugged and integrated to the board. 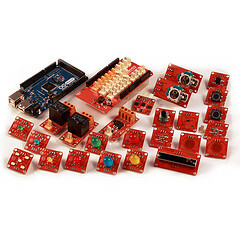 A complete Arduino ADK Sensor Kit costs 249 euros and it contains a lot of stuffs to play and experiment with. An intro book to the world of Arduino is Arduino Cookbook by Michael Margolis. And the Google reference is here Android Open Accessory Development Kit. And thanks to Chris Anderson weblink, posted in Google+, there is a good presentation by Nick Pinkston, Founder, CloudFab on Hardware is the new Software. From the intro to the video: We see the power of cheap cloud hosting, OSS, and incubators to make building a web app cheap, and now the same is happening to hardware. The means of production is becoming democratized and agile hardware startups are popping up to solve problems. It has never been that easy to create and explore with Hardware, Software, Mobile Phones, Sensors and Internet. We are going to see very interesting things in this near future. UPDATES: Today, the first official iPhone hacker cable + Arduino interface board is out! Not quite as neat as the Android ADK, but very welcome, see the Redpark Breakout Pack for Arduino and iOS. But there are several threats to this growth, and one of them is around royalties and patents claims. 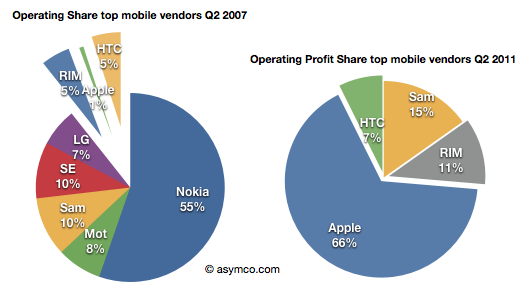 Horace Dediu at asymco.com wrote in his blog that Microsoft has received five times more income from Android than from Windows Phone. HTC pays Microsoft $5 for each Android device they manufacture. And this month Microsoft has signed several other deals, see the FOSS Patent blog Android device makers sign up as Microsoft patent licensees — an overview of the situation. Today is Samsung’s turn, TheRegister writes Behind Microsoft’s $15 Samsung Android royalty claim. And the latest claims on Android’s royalties come from Oracle that wants handset makers to pay $20 for each Android device they make, see Oracle win would strain Android growth. A related news is the smartphone marketing is booming as Nielsen reports that In US, Smartphones Now Majority of New Cellphone Purchases. Smartphones continue to grow in popularity. According to Nielsen’s May survey of mobile consumers in the U.S., 38 percent now own smartphones. And 55 percent of those who purchased a new handset in the past three months reported buying a smartphone instead of a feature phone, up from 34 percent just a year ago. If we accept the thesis that in smartphones there has been a shift from a battle of devices to a war of ecosystems, we also need to understand what it means to customers, customer loyalty and lock-in. What are customers choosing when buying a smartphone? A brand, a design, an easy to use device, an app ecosystem, a platform? How easy is for customers to move from one platform to another? I would argue that once a customer invests in a platform, he/she is more likely to stay with that platform due to the ecosystem-based competition. Inspired by The Android (in)adequacy: How to tell if a platform is good enough by the post of Horace in asymco.com, I am writing my point of view here. In the pre-apps/pre-Apple world, switching platform or device was relatively easy. Mobile phones and smart phones were primarily communication devices and stickiness was mainly driven by inertia, brand and probably the phonebook. But the app economy has changed that. First of all, investing in apps for a certain platform makes users continue with the same platform. Second, now customers buy a device with the app ecosystem and expect to find their favorite apps there. The app ecosystem does not provide a lock-in. Apps are generally not expensive and applications seem to be hit-based and they become “obsolete” . It is also the case that applications are not generally exclusive to a single platform as they are usually ported to the main smartphone platforms. In summary, apps are becoming an hygiene factor. In order to compete, a platform has to have a strong base of “must have” essential apps (e.g. Angry Birds, Facebook, Twitter). After that, the platform does not acquire a competitive advantage. That´s the need for the next wave of ecosystem “lock in”. The next level of stickiness is represented by the ecosystem, defined in a more broader sense than the app ecosystem. Apple gives us an example, with the iCloud, iOS AirPlay and FaceTime features. If you are part of the Apple ecosystem your devices are seamlessly synchronized using the cloud, and you can nicely stream content between them. If you buy an iPhone you may want to buy a Mac and Apple TV. And so your family members and friends, if you want to have FaceTime with them. If your devices are part of one ecosystem your experience is great, if they are not, you may not have those experiences or eventually have degraded/fragmented experiences. This is a battle of ecosystems and the different platforms are creating switching barriers. For a platform is certainly very important and essential to be good but probably it just needs to be good enough to retain customers if its ecosystem is competitive. Once customers invest in one ecosystem they are less likely to switch. The nurturing and growth of the platform ecosystem is the next step to customer loyalty (and lock-in).